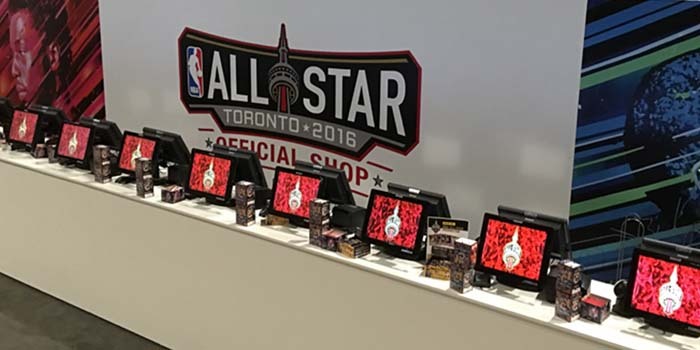 Uniwell Americas Inc. has successfully installed 10 units of Uniwell POS terminals (HX-4000) with large LCD customer display at NBA All Star in Toronto 2016. It was the first time NBA all-star game to be held in Toronto. POS operation has to be easy by casual staff, since this is not a permanent shop. Uniwell POS was easy enough for casual staff to deal with busy sales. Uniwell POS did not only contribute fast and secure transaction, but also helped creating magnificent atmosphere with its stylish design in the special shop.